All sea turtles are considered an endangered species. 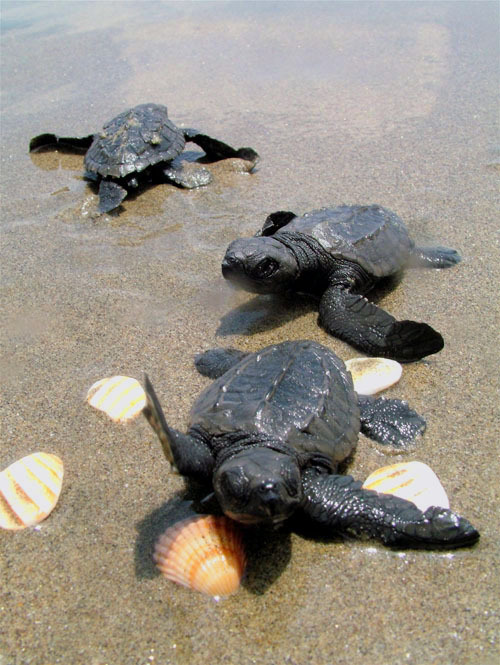 The five type of turtles that nest at the East Cape are the Green Sea turtle, the Hawksbeak, the Olive Ridley, the Loggerhead and the extremely rare giant Leatherback turtle, which in 2009 had five known nests in our area. The local inhabitants of Los Barriles have limited financial resources to participate in turtle conservation, yet they do. This is a testament to the spirit of the people that volunteer their precious time to help identify nests and make warning signs and barriers to protect these beautiful animals. Several times a year there are gatherings in front of the Villas de Cortez to release the collected hatch-lings to return them to the Sea of Cortez. Check for postings at BajaTurtles.com for release dates. Stay with us at The Villas de Cortez to be a part of this wonderful experience. Sea turtles dig nests and lay their eggs right in front of The Villas de Cortez Resort and along the beaches of the East Cape of the Baja Peninsula. The local people of Los Barriles need help in their efforts to find and barricade nests that may be in jeopardy. It is estimated that one in a thousand sea turtles live long enough to return to lay eggs. Often times the eggs need to be removed and transferred to a incubator until the hatch-lings are ready to return to the sea and begin again the circle of life. The rescue volunteers have been working diligently to protect the turtles from predators, the sometimes harsh environment and human intrusion that challenges their survival at the nesting grounds that they have returned to for thousands of years. All that love the rugged beauty of this amazing area can agree that these turtles are a part of what makes this such a wonderful place. We recognize that by respecting them and their home we help to ensure the preservation of not only these Sea Turtles but all of the wildlife of this unique Eco-system.